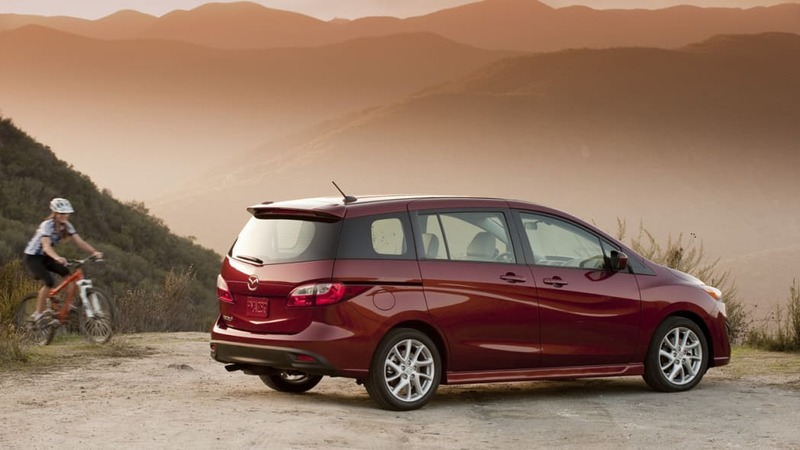 We have quite the soft spot for the Mazda5 mini-minivan. It's a taller, more capacious version of the zippy Mazda3, and it stands totally alone in a class of Americanized small MPVs (until the Ford Grand C-Max arrives on our shores, that is). Mazda has given the 5 a healthy once-over for the 2012 model year, and the automaker has just announced that the swoopy new people-mover will be priced from $19,990 (including destination and delivery). That sub-$20,000 price point gets you the base Sport model, which has 16-inch wheels, air conditioning, power windows and mirrors, tilt/telescope steering wheel, remote keyless entry and safety features like Dynamic Stability Control and traction control. The $21,990 Touring model adds 17-inch alloys, a five-speed automatic transmission, Bluetooth, and a leather-wrapped steering wheel. The top-rung Grand Touring ($24,670) will net you a moonroof, automatic xenon headlamps, heated mirrors, rain-sensing wipers, heated leather front seats and an upgraded audio system with Sirius satellite radio. The entire Mazda5 range is powered by the automaker's 2.5-liter inline-four (found in the Mazda3, Mazda6 and CX-7) that produces 157 horsepower and 163 pound-feet of torque. Base Sport models come standard with a six-speed manual transmission, while a five-speed autobox is the only transmission available on Touring and Grand Touring models. Look for the 2012 Mazda5 to hit dealerships in January of 2011. For the full details, follow the jump for Mazda's press release. IRVINE, Calif. -- Mazda North American Operations today announced that the 2012 MAZDA5 compact multi-activity vehicle will have a starting manufacturer's suggested retail price (MSRP) of $19,990, including destination and delivery. The 2012 MAZDA5 will go on sale at dealers across the U.S. in January 2011. The 2012 MAZDA5 will be offered in three trim grades: a well-appointed Sport, the mid-level Touring and the top-of-the-line Grand Touring. Regardless of equipment or specification level, all 2012 MAZDA5s feature a host of standard safety features, including Dynamic Stability Control (DSC), traction control, anti-lock brakes (ABS), tire-pressure monitoring, and dual front, front-seat and side curtain airbags that offer protection to all three rows. The well-equipped MAZDA5 Sport includes 16-inch alloy wheels with 205/55/R16 all-season tires, power mirrors, air conditioning, power windows and door locks, AM/FM/CD/MP3 stereo with six speakers, audio auxiliary jack, tilt and telescoping steering wheel, remote keyless entry system, one-touch up/down driver's window, 50/50 split fold-down third row seats and steering wheel-mounted audio and cruise controls. 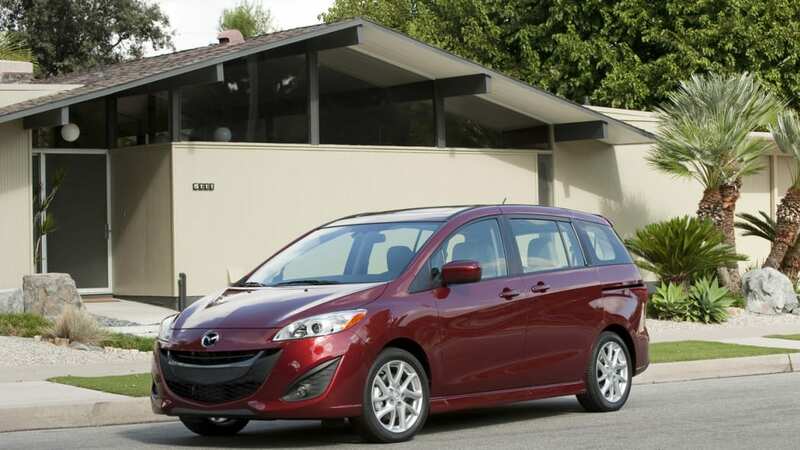 The MAZDA5 Touring (from $21,990) is equipped with a five-speed automatic transmission, 17-inch alloy wheels with P205/50R17 all-season tires, sport side still extensions, rear liftgate spoiler, fog lamps, Bluetooth® hands-free phone and audio, leather-wrapped steering wheel and shift knob and trip computer. Available on Touring models is a Moonroof and Audio Package ($1,140) which includes a power moonroof, in-dash 6-disc CD changer and Sirius satellite radio. The top-of-the line Grand Touring model (from $24,670) adds a power moonroof, xenon high-intensity discharge (HID) headlights, automatic on/off headlights, heated door mirrors, rain-sensing windshield wipers, anti-theft alarm system, driver's seat lumbar support adjustment, heated front seats, in-dash 6-disc CD changer, leather-trimmed seats and Sirius satellite radio. The 2012 MAZDA5 is powered by a 2.5-liter MZR I-4 engine and can be paired with either a six-speed manual (Sport models only) or five-speed automatic transmission (standard on Touring and Grand Touring). The MZR 2.5-liter produces 157 hp at 6,000 rpm, and 163 ft-lb of torque at 4,000 rpm. Celebrating its 40th Anniversary in the United States in 2010, Mazda North American Operations is headquartered in Irvine, Calif. and oversees the sales, marketing, parts and customer service support of Mazda vehicles in the United States, Canada and Mexico through nearly 900 dealers. Operations in Canada are managed by Mazda Canada, Inc., located in Ontario; and in Mexico by Mazda Motor de Mexico in Mexico City.